Airbnb was named Company of the Year by Inc.com in 2014, and by 2015 the website had roughly 1 million listings on its website throughout the world. So it’s not surprising that companies aiming to turn homeowners into hosts have jumped aboard this trend. One of the biggest vacation rental growth sectors is in data collection tools to ensure that hosts are properly pricing units based on local demand — similar to data that hotel chains use to competitively price rooms. These resources are particularly helpful for people who are thinking about listing a home on the site or who live in high-demand areas that experience dramatic shifts in tourism throughout the year. 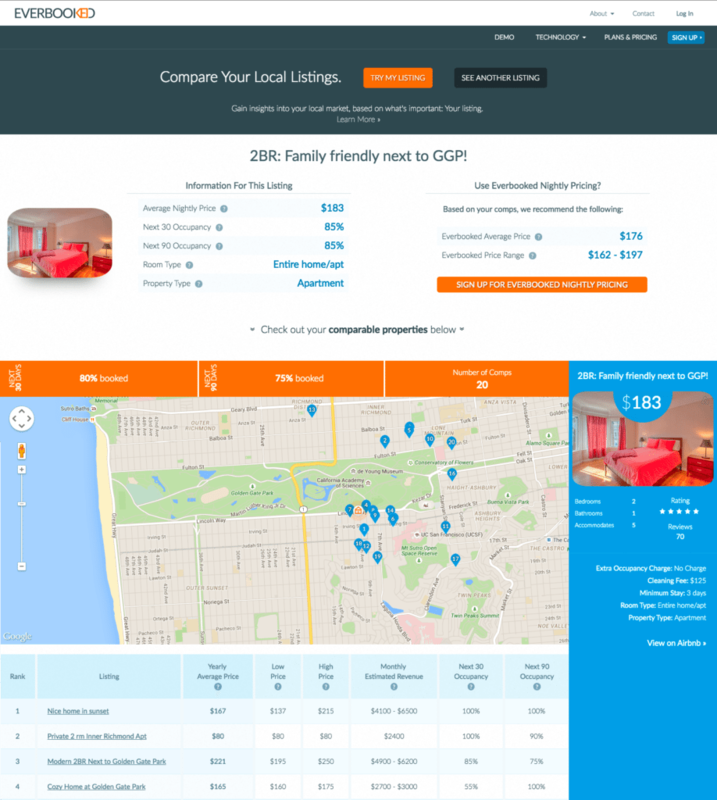 Everbooked has launched a comprehensive comparable listings research tool specific to Airbnb that will help hosts competitively price their properties based on supply and demand. Hosts are also able to research Airbnb rental income to see how much they will make by listing their property. Ordal has been in the travel business for years and deems himself a “data nerd.” He believes the comps tool by Everbooked is a great way to give power to the little guy, giving them easy access to information so they can accurately price their property. The Everbooked comps tool also has an interface where property managers can see how the local market is faring. Hosts enter their Airbnb listing URL, and the system sifts through nearby properties, scoring, ranking and presenting them in list form based on the most comparable properties. They can also be viewed in a map with geo pins. Everbooked’s Airbnb comps tool in action. Each listing has a table of data available, as well as the host’s data. Users can view information like average nightly price, occupancy for the next 30 and 90 days, the type of unit (private room or whole apartment) and type of property. Based on the comps tool, users will get an Everbooked nightly average price and price range for their space. They can also view a list of yearly average prices, low prices and high prices for the top comparable listings nearby, as well as the monthly estimated revenue. Everbooked runs a series of statistical algorithms to calculate metadata for each listing on the site. Then, it uses proprietary algorithms to help weed out any junk, spam or test listings so that the data supplied is accurate. In order to accurately compare the users listing with others in the region, the specific attributes of the space are taken into consideration. The data collection and analytics mechanisms sort through factors like room type, capacity, occupancy, price, proximity, number of bedrooms and more. The goal is to create an industry that is more transparent. So that not only can Airbnb hosts price their homes competitively, but guests won’t have to worry about being overcharged for their stay. Access to the tool is free and will be available for 2,741 individual cities, including the top 22 markets in the country.